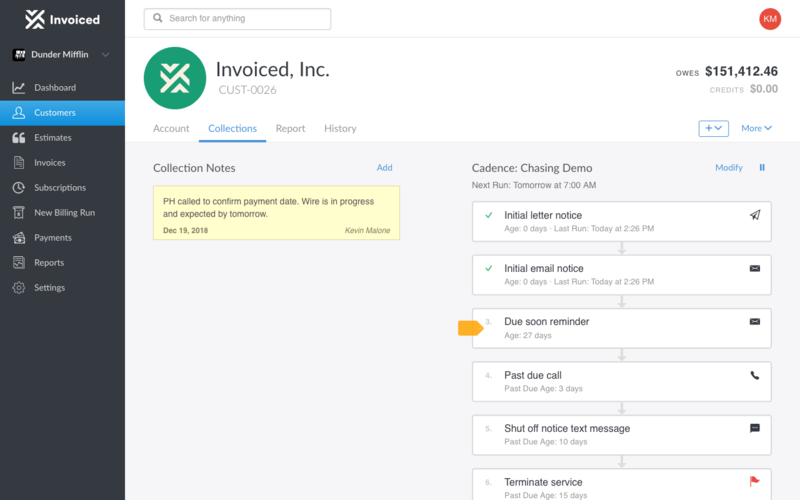 Smart Chasing helps you close the gap on getting paid by codifying your invoice distribution and follow ups. Once setup, Invoiced will ensure that collection activities always happen on time. 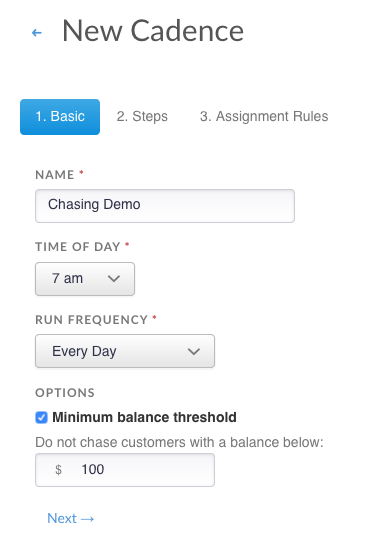 With chasing you setup your cadences once, and then enroll customers in the appropriate cadence. 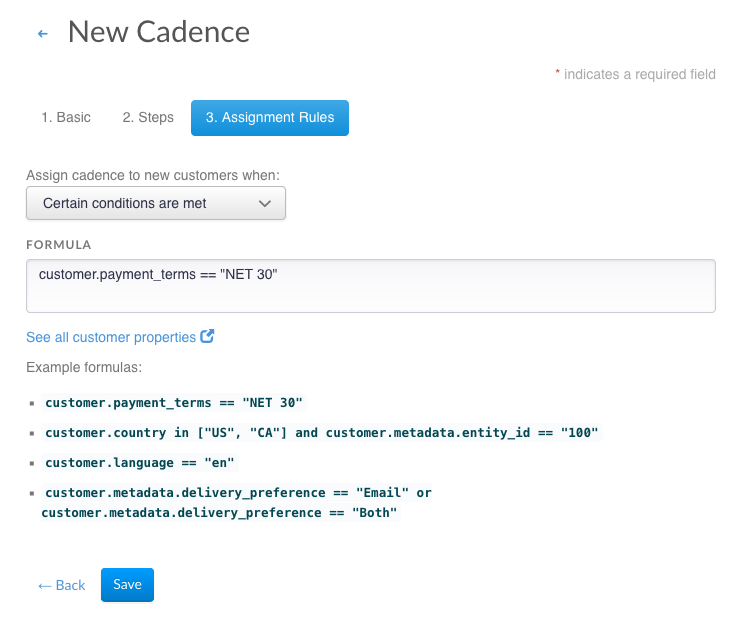 A cadence contains the steps you'd like to take when working a customer account towards paid. Cadences describe how and when to follow up with your customers. Each communication is personalized to the account to maximize its effectiveness. A cadence consists of a series of steps to be taken according to the account's age (how many days the customer has owed you money). If at any point the customer pays the balance in full then the cadence stops. According to the example above, a customer with a newly issued invoice would receive a letter and an email from Invoiced. As the account ages the other actions would take place. Most actions are completely automated, with the exception of phone calls and escalations, which must be handled by a team member. One nifty aspect of chasing is that you get to choose when cadences run. For example, you could choose to execute any scheduled activities at 7am every day. Or maybe you want to restrict this to specific days of the weeks or month. Chasing gives you the fine-grained control to make sure you are reaching your customers at optimal times. Each cadence has its own timing settings that run at the time that you have specified. Any times given are based on your company time zone in Settings > Business Profile. Chasing attempts to collect the customer's entire account balance, with some exclusions noted below. This means that if a customer has multiple invoices outstanding they are only receiving a single communication at a time from the system about their outstanding balance. The customer account age is the oldest open invoice or installment. The past due age is the oldest invoice or installment due date. If no due dates were used within a customer account then any steps based on past due age will never execute. This document describes the latest version, Smart Chasing. If you are using the legacy chasing feature then you can find the docs here. Please contact support@invoiced.com if you would like to be upgraded to Smart Chasing. The first step to using chasing is to setup a cadence. You can build as many cadences as you'd like and assign them to customers based on how you would like them to be followed up. Go to Settings > Chasing in the Invoiced application. Click New Cadence. In the first step you will give your cadence an easily identifiable name, configure when chasing activities should occur, and optionally set a threshold if you do not want smaller balances to be chased (i.e. < $100). The second step is the most important part. This is where you build the schedule of chasing activities. Each step represents a single action that will happen. You specify the account age or past due age when that step should run. Depending on the action selected there will be different settings. For example, in the email step you can select which email template to use. 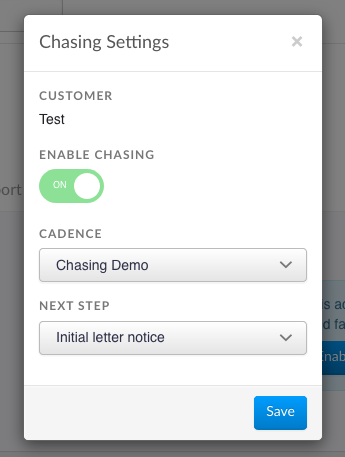 In the final step you can have chasing cadences automatically assigned to customers based on certain conditions, like payment terms or customer language. If you do not setup any assignment rules then the cadence must be assigned to customers. Once you are ready click the Save button to create the cadence. You can come back and edit the cadence any time, however, once assigned to customers you cannot change the schedule. Now that you have one or more cadences, you can start assigning them to customers. 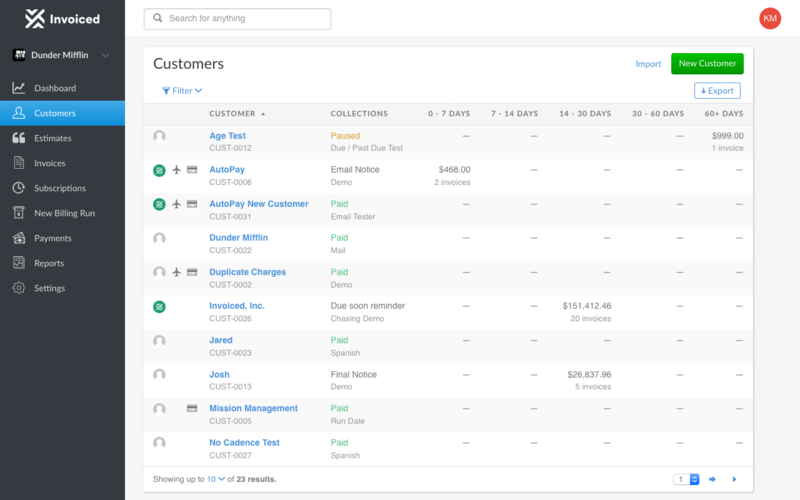 You can see chasing progress across your entire customer list at a glance. If you want to see the specifics of an individual account then you can go to the Collections tab of that customer's account. Below we describe each of the chasing actions supported, including emails, letters, text messages, phone calls, and escalations. The email action allows you to send an email to customers. The email will have a "Pay Now" button directing the customer to the customer portal. You can optionally have all of the outstanding invoices attached to the email as a single PDF attachment. 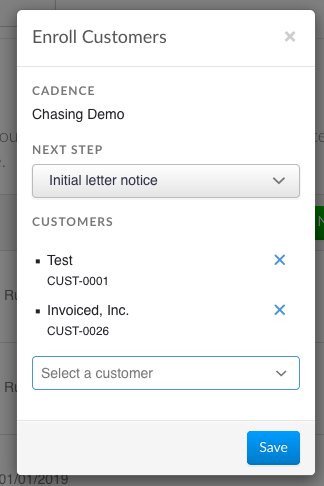 The letter action will mail an Open Item statement to your customer via our Lob integration. In order to use this feature you must have a Lob account connected. The text message action will send a text message to the customer's text-message enabled phone number on file (must be added as a contact to the customer). In order to use this feature you must have a Twilio account connected. 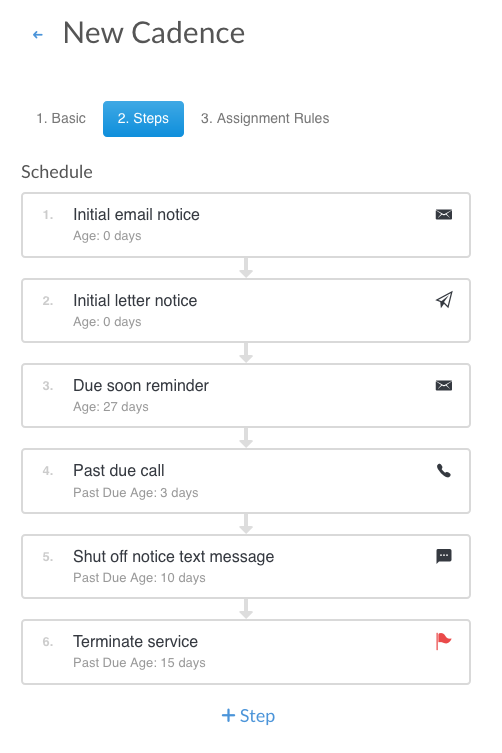 The phone call action will add an item to your to do list. You or another team member will be responsible for making the call. 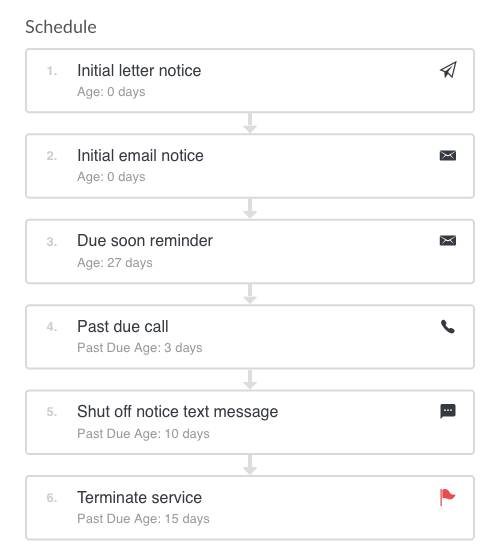 Our system makes it easy to keep track of any collection calls and record notes. An escalation will flag an account for review. This can go on the team-wide to do list, or can escalate an account to a specific person and get added to their to do list.